The twenty-something bartender, her long hair dyed blonde, wore very short shorts last Friday during the warm weather. Men of varying ages were glued to the bar, doing nothing more to do than drink beer and catch a glimpse of skin. Although I have flashed a bit of cleavage in my time, I’m more deliberate now on how I dress. I don’t know what the men in the bar thought of me, or even if they ever peeled their eyes off the bartender for a moment. Nor did I care. 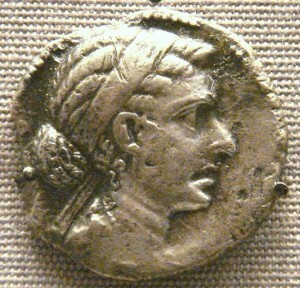 Cleopatra would not be one who captured men’s attention by her appearance. Elizabeth Taylor, with her gorgeous purple eyes, in the 1963 epic Cleopatra, suggested that Cleopatra was more beautiful than most of us. Plutarch, an ancient historian, writes that Cleopatra was not a great beauty. Her looks were not “as such as to strike those who saw her.” So what made her so attractive? Closer to how Cleopatra really looked? I’ve seen coins with Cleopatra, and her nose is huge. Maybe it was to suggest she had a “Roman nose,” but I can’t imagine anyone thinking she was good looking. The popular phrase is that beauty is in the eye of the beholder. I’d add something else to that. The size of Cleopatra’s nose didn’t matter. Intelligence, which gets better with age, influences the eye.